Intel Processor Trace (PT) traces program execution (every branch) with low overhead. It is not a full introduction to PT. Please read Adding PT to Linux perf or the links from the general PT reference page. Broadwell (5th generation Core, Xeon v4) More overhead. No fine grained timing. Skylake (6th generation Core, Xeon v5) Fine grained timing. Address filtering. Goldmont (Apollo Lake, Denverton) Fine grained timing. Address filtering. PT is supported in Linux perf, which is integrated in the Linux kernel. It can be used through the “perf” command or through gdb. There are also other tools that support PT: VTune, simple-pt, gdb, JTAG debuggers. Linux 4.6 Bug fixes. Support address filtering. Many commands require recent perf tools, you may need to update them rom a recent kernel tree. This article covers mainly Linux perf and briefly gdb. Check if PT is supported and what capabilities. to try to save a long trace, but work with shorter traces. Long traces also take a lot of time to decode. When decoding kernel data the decoder usually has to run as root. Record program execution and display function call graph. perf script by defaults “samples” the data (only dumps a sample every 100us). Show every assembly instruction executed with disassembler. Slice trace into different time regions Generally the time stamps need to be looked up first in the trace, as they are absolute. 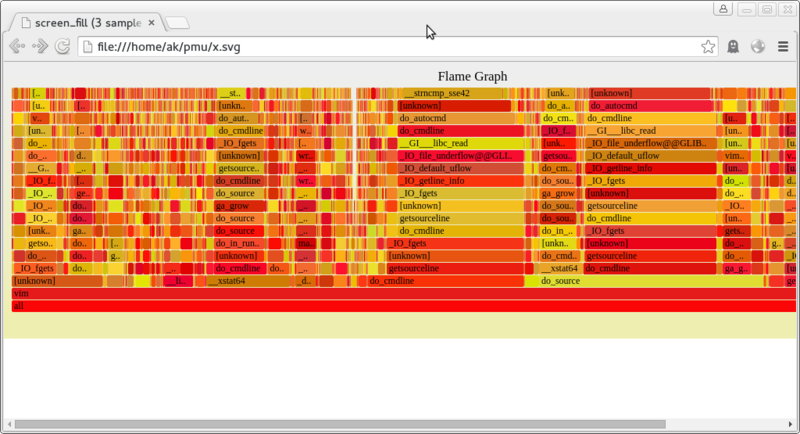 Install Flame graph tools first. This collects data, but does not continuously save it all to disk. When an event of interest happens a data dump of the current buffer can be triggered by sending a SIGUSR2 signal to the perf process. Start tracing in program at main and stop tracing at func2. Requires a new enough gdb built with libipt. For user space only. trace. 'start' and 'stop' filters need not specify a .
Intel Processor Trace (PT) can be used on modern Intel CPUs to trace execution. This page contains references for learning about and using Intel PT. Adding processor trace to Linux describes the Linux perf Processor trace implementation. simple-pt is an alternative reference PT implementation. It is implemented on Linux, but can be also used as a starting point to implement PT on other OS. A Windows windbg processor trace plugin for debugging on Windows with PT. A reference Processor Trace decode library. Energy efficient servers – Blue prints for data center optimization from Gough/Steiner/Sanders is a new book on power tuning on servers that was recently published at Apress. I got my copy a few weeks ago and read it and it is great. Disclaimer: I contributed a few pages to the book, but have no financial interest in its success. As you probably already know power efficiency is very important for modern computing. It matters to mobile devices to extend battery time, it matters to desktops and servers to avoid exceeding the thermal/power capacity and lower energy costs. Power management in modern systems is quite complex, with many different moving parts, hardware, operating systems, drivers, firmware, embedded micro-controllers working together to be as efficient as possible. I’m not aware of any good overview of all of this. There is some lore around — for example you may have heard of race to idle, that is running as fast as possible to go idle again — but nothing really that puts it all into a larger context. BTW race-to-idle is not always a good idea, as the book explains. The new book makes an attempt to explain all of this together for Intel servers (the basic concepts are similar on other systems and also on client systems). It starts with a (short) introduction of the underlying physical principles and then moves on to the basic CPU and platform power management techniques, such as frequency scaling and idle state and thermal management. It has a discussion on modern memory subsystems and describes the trade offs between different DIMM configurations. It describes the power management differences between larger servers and micro servers. And there is a overview of thermal management and power supply, such as energy efficient power supplies and voltage regulators. Finally (and perhaps most valuable) the book lays out a systematic power tuning methodology, starting with measurements and then concrete steps to optimize existing workloads for the best power efficiency. The book is written not as an academic text book, but intended for people who solve concrete problems on shipping systems. It is quite readable, explaining any complicated concepts. You can clearly tell the authors have deep knowledge on the topic. While the details are intended for Intel servers, I would expect the book to be useful even to people working on clients or also other architectures. One possible issue with the book is that it may be too specific for today’s systems. We’ll see how well it ages to future systems. But right now, as it just came out, it it very up-to-date and a good guide. It has some descriptions of data center design (such as efficient cooling), but these parts are quite short and are clearly not the main focus. The ebook version is currently available as a free download both at the the publisher after registration, or at amazon as free kindle edition, or as reasonable priced paperback. 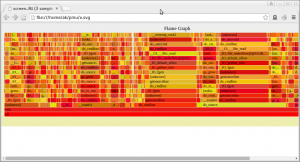 I published an article at LWN: Adding processor trace to Linux. It describes the Linux perf support for the Intel Processor Trace feature on Intel Broadwell and other CPUs. Processor Trace allows fine grained tracing of program control flow.